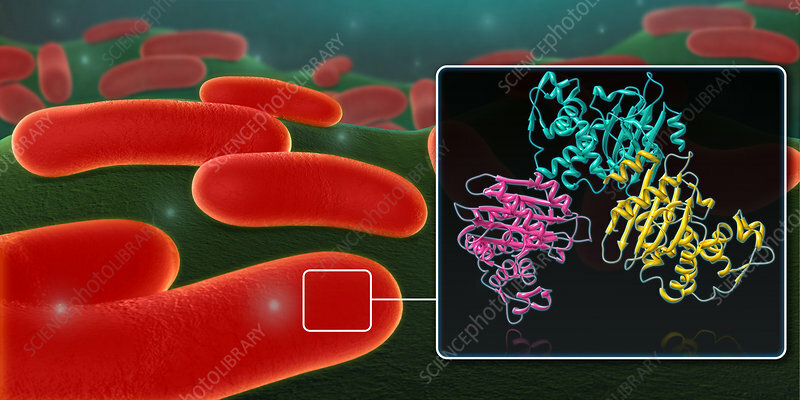 An illustration depicting carbapenem-resistant Enterobacteriaceae (CRE), a family of gram-negative bacteria which have a high level of antibiotic resistance. Carbapenems are antibiotics usually prescribed as a last resort when other treatments for bacterial infections have failed. The inset within the image depicts a carbapenemase enzyme produced by CRE, which breaks down carbapenem antibiotics to make them ineffective. Klebsiella bacteria and Escherichia coli (E. coli) are normal Enterobacteriaceae found in the human gut that can become carbapenem-resistant, but do not usually infect healthy individuals. Patients receiving treatments for other conditions who require ventilators, catheters, I.V. 's or who are prescribed long courses of antibiotics are more at risk of CRE infections.